An electron micrograph shows human immune system cells attacking methicillin-resistant Staphylococcus aureus (MRSA). 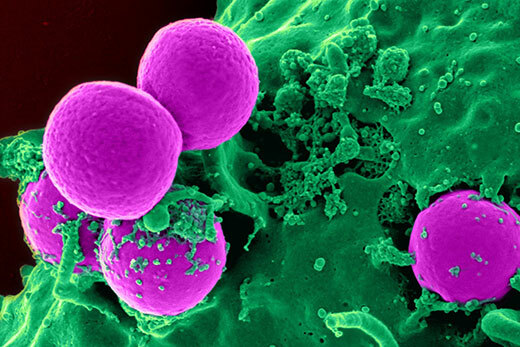 MRSA is an example of antibiotic-resistant bacteria that can occur in multiple strains in an infection, further complicating diagnosis, treatment and interventions. The Centers for Disease Control and Prevention (CDC) awarded $380,000 to three Emory University faculty to develop and refine a promising technique to detect and respond to threats from drug-resistant pathogens. The grant investigators include Lars Ruthotto and Ymir Vigfusson — both assistant professors in the Department of Mathematics and Computer Science — and Rebecca Mitchell, a visiting professor with a joint appointment in the Department of Mathematics and Computer Science and the Nell Hodgson Woodruff School of Nursing. The trio is developing a method to quickly and cost-effectively diagnose multiple strains of antibiotic-resistant bacteria within a single biological sample. “This project harmonizes our different scientific specialties,” Vigfusson says. He is a computer scientist who develops software and programming algorithms that work at scale, while Ruthotto is a mathematician who focuses on solving inverse problems. Mitchell is a veterinarian and epidemiologist experienced in gathering biological samples and testing them for pathogens. Antibiotic-resistant infections are a growing national and global problem, causing at least two million illnesses and 23,000 deaths in the United States annually, according to the CDC. The Emory grant is part of a $9 million package of CDC funding announced today, including awards to projects at 25 leading research institutions around the country that are exploring gaps in knowledge about antibiotic resistance and piloting innovative solutions in the healthcare, veterinary and agriculture industries. The work complements broader CDC efforts to support known strategies for protecting people and slowing antibiotic resistance, collectively known as the CDC Antibiotic Resistance Solutions Initiative.